Inspired by an antique Amish quilt, it is the colours that make this quilt sparkle. The quilt is made from solid fabrics, but can of course be made with patterned fabrics too. This quilt was made for our second grandbaby, and the plan has always been to make it in both Christmas fabrics and delicious pinks. It is easy to make and therefore suitable for beginners. This is an excellent scrap project as you don’t need much of each fabric, and the size can easily be changed. Dig out fabric scraps in light and dark values, pair them up with a couple of pieces of fabrics, and make this fun and graphic Christmas table cloth with appliquéd text. This English version includes letters for MERRY CHRISTMAS. The Merry Christmas-cloth will look just as good in traditional Christmas colours as in neutral tones. Welcoming new little citizens of the world is always a wonderful thing, and it would be nice to create a baby quilt for each child and grandchild of family and friends. 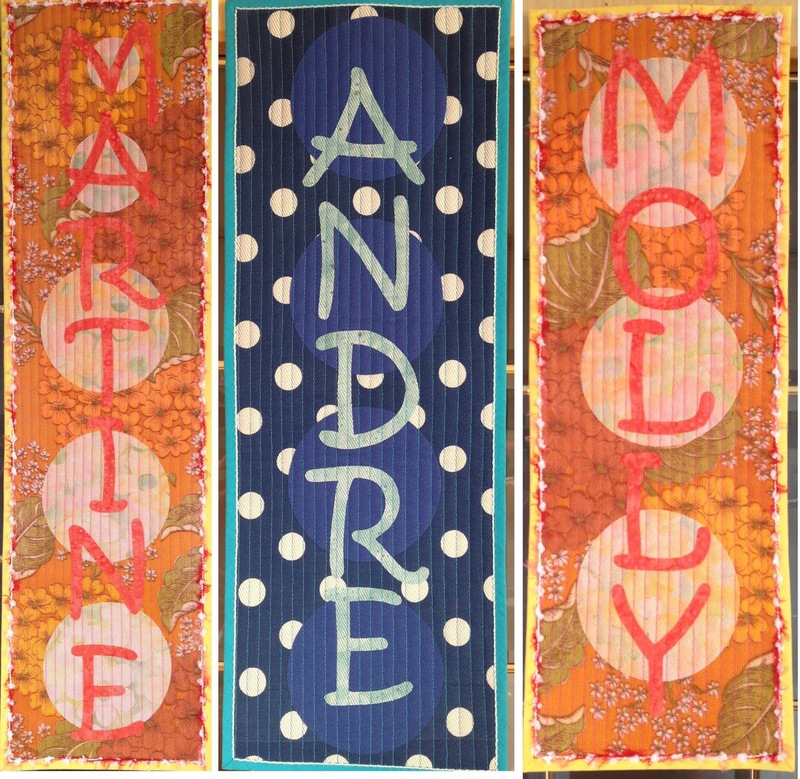 Now, that will not always be possible, so over the last few years I have made quite a few name banners instead. This time I dived into my collection of thrifted goodness, and gave new life to a 70ies curtain and a friend of my mother in law’s 60ies skirt. 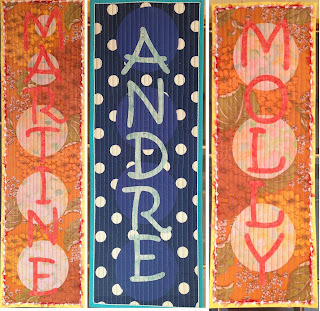 Have fun making banners; there is no piecing involved so you can use any fabric that you have laying around, and you can add any kind of text. Make a few for upcoming birthday parties; names, sports, hobbies, anything goes. Make a few for Christmas, they would make wonderful presents, and with the machine stitched binding, they don’t take much time. This scrap quilt is an excellent project for using up different kinds of scraps, and also orphan block or even an abandoned top or two. 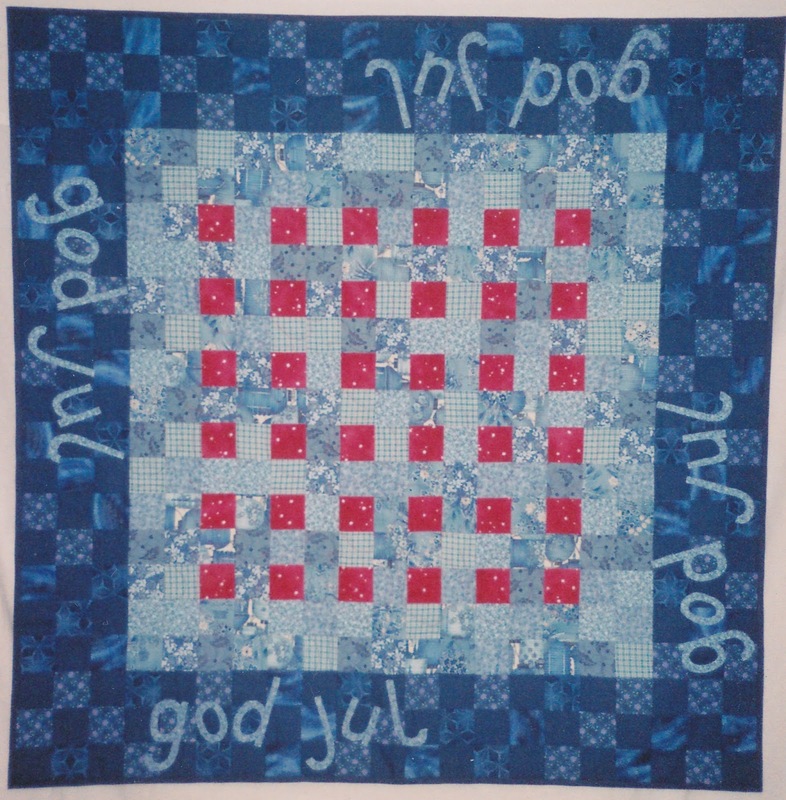 The blocks are easy to make, and are suitable also for the not so experienced quilter. 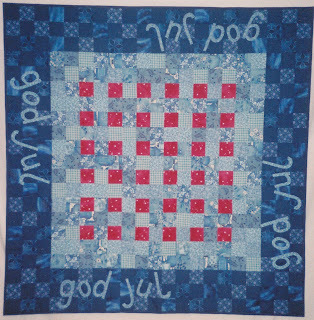 You can easily change the size of both the blocks and the quilt, and you will find tips on how to do so in the pattern. This quilt was made with scraps from 3 different projects where many of the scraps lasted further than far, from one project to the next, hence the title. Whether you choose to work within one colour family or the whole rainbow is up to you. You will find tips on how to control the colour chaos when you use lots of different colours in one project. This is a fun project for those who would like to have a go at working with non-typical quilting fabrics. As the title suggest, the table runner is made from 4 curtains and the back of a shirt, and you probably too have some fabrics stashed away with which you are not quite sure what to do. The table runner will of course look just as good in quilting cottons. Getting close to Christmas a few years ago, I needed some extra gifts that did not take too long. This design came to life because I wanted to play with log cabin design possibilities without actually having to make log cabin blocks. The design looks intricate enough, but is very easy to make. I have made the quilt in purple with yellow, orange, pink, red and turquoise squares, and the result was quite different. The quilt will look just as good in other colours and with printed fabrics. to my Pattern Page; I hope you will enjoy your stay! All patterns are pdf-patterns and are sold through email for now.